We had gone to my Mum's near Chester on Saturday and stayed over, so Sunday morning saw us undertake a rather enjoyable one hour cross country dash to RAF Cosford near Wolverhampton. 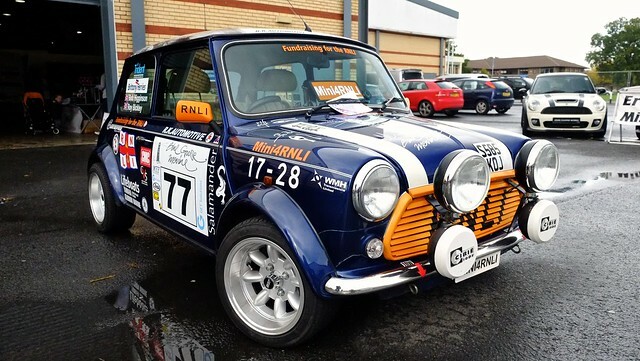 This was for a Midlands Breakfast Club which we were going to with Yam MINI. We were running a little late but still got parked with the rest of the Yam crew on what was a very cold morning. The Costa coffee shop was our first stop. Now in truth I'm not a Costa fan but this time we had some lovely honeycomb flavoured hot chocolate as well as Cosford's own bacon and sausage baps. Always a good start. We had a natter with some of the Yam gang but in truth we spent the morning exploring the cars and planes in the company of S Monster aka Craig, whose dry humour was most amusing. The mission as we so often do at these meets, was to choose our favourite cars from the offerings on display and often this is not the most exotic, but the cars that we can most see being in the Beastie Stable. So the lovely Ferraris were passed by as just too exotic. 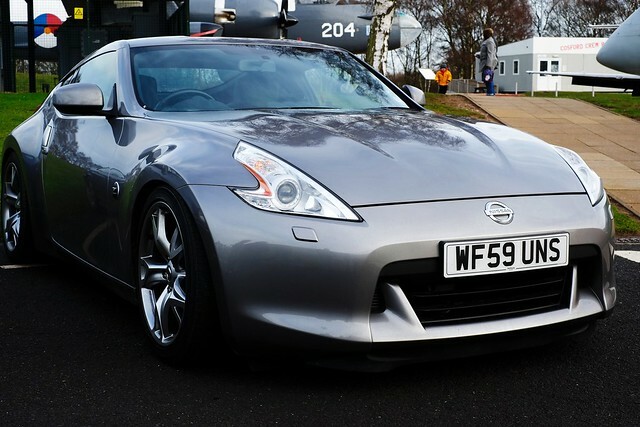 The Cayman S was a contender of course but finally Lady Peanut was rather taken with a Nisan 370 Z, though the annual car tax at over £800 gave her pause to think. 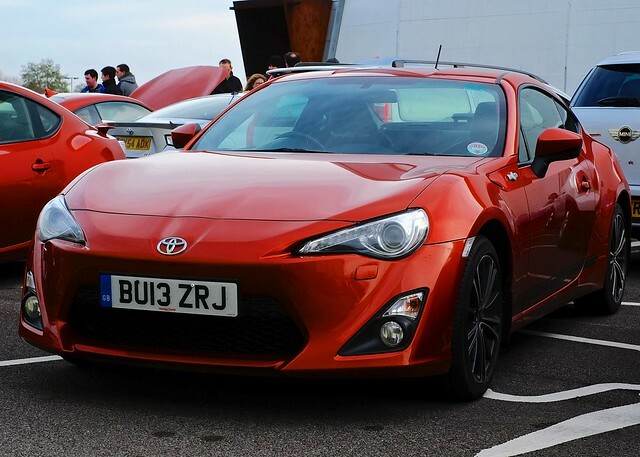 For me, the Toyota GT86 beauties were very appealing, while Craig plumped for a classic Lotus Elan, though I did wonder if me saying "You could just picture Emma Peel getting out of one of those" affected his judgement. 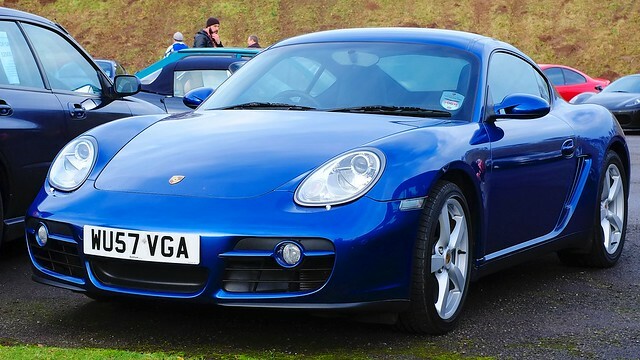 His other contender was the Blue Cayman S, as he felt that he could get this approved from his better half, as " the colour matched that of his new front door" and so Lynne might well like that! We reached the point when we could stand the cold no more, so had a look at the planes on display, which actually, are really quite wonderful and should not be forgotten while you are admiring the cars. The weather was dull and cold and I am in truth a fair weather photographer as I do not like my hands being cold, so to make this selection a tad different they are all rendered in the style of Fuji Provia ISO 100 film. So I hope you enjoy the photos from our day and as always click any photo to see a slideshow from the day. MINI Fair 2 was a MINI show at Stoneleigh, primarily for the Classic MINIs and one that will be our final MINI event of 2013. 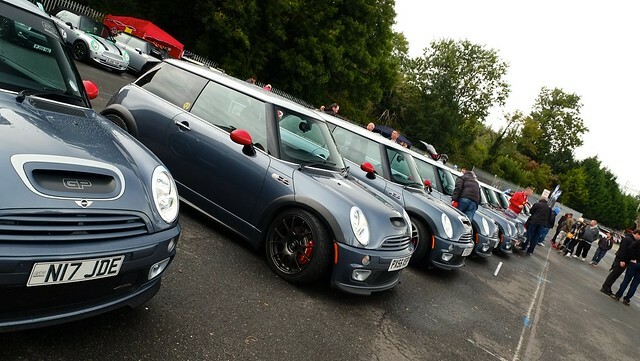 We have a few more car events left on this year's calendar but this was the last MINI event. Unfortunately, Peanut had to work, so it was one I had to go to on my own. The theme of the event was Halloween and all the club stands were asked to theme their stands accordingly. 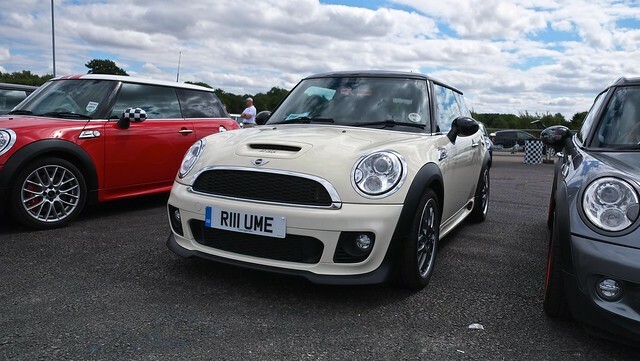 I had signed up with The Clubman Register and was taking our ClubBeast along for the day. He is under the weather just now, with a couple of engine lights impersonating the Blackpool illuminations on the dash and a turbo that isn't working. 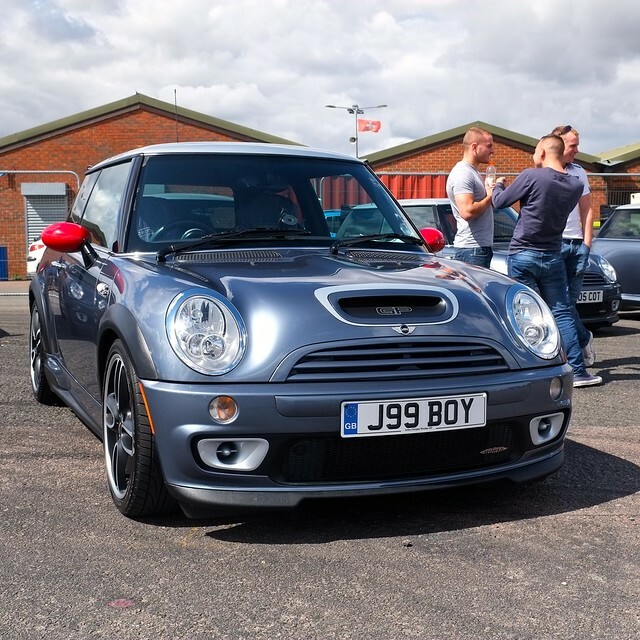 I wanted to receive counsel from a few chaps on the Clubman Register before tackling the turbo issue on ClubBeast and this event gave me a chance to do that. An early start and an hour's drive to the show saw me arrive at 8.30 with a very dirty car and if I'm honest little will power to spend the day cleaning it. Fortunately Mrs P had made it her business to get me a wizard's cape and hat for the day, so I think I was forgiven my dirty car. 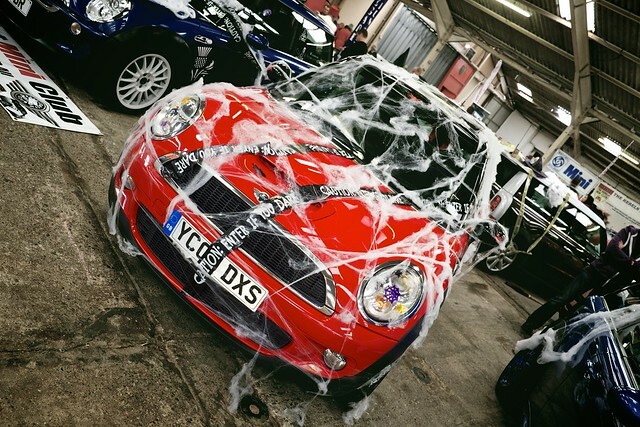 Brettles gave me a load of webs and crime scene tape and the Clubbie soon loooked like he belonged on the stand. 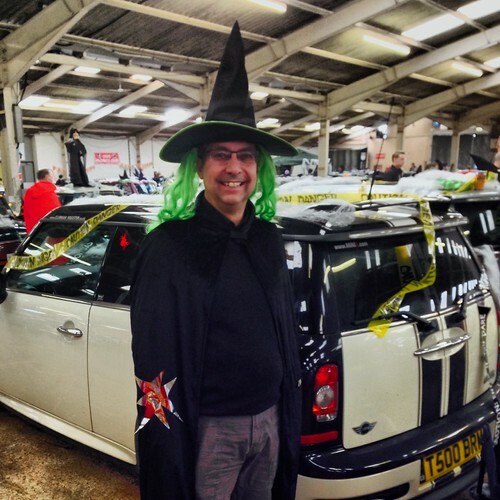 There were a lot of Wizards, witches and WarLords there too, so I felt quite at home! Carrot cake was also a welcome treat courtesy of Jeanette on the CR stand and it was a very civilised affair getting a coffee at this show too. Coffee getting was frankly a hideous experience at the Penkridge New MINI show, where the queues were awful. The show was in two halls one for the traders and a concours area and a second hall for the clubstand and this made it a rather good show. 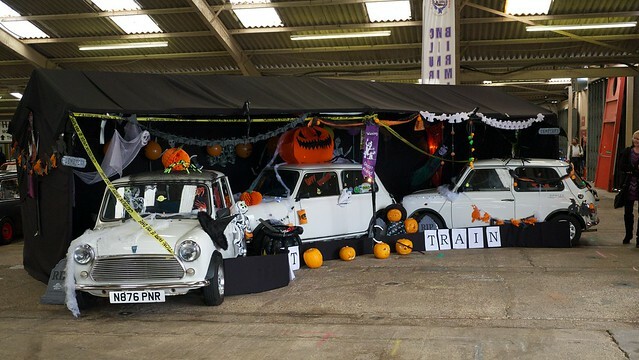 All the clubstands were well decorated and there were some great cars on display - both new MINIs and classics and the winning club stand, which had three white minis forming a ghost train was quite ingenious! 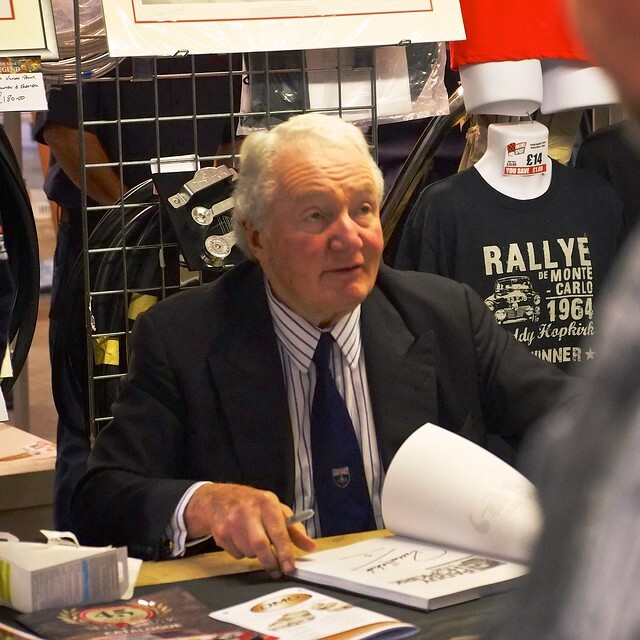 There were a lot of trade stands there too, though most were catering for the classic market and it was nice to see the legend that is Paddy Hopkirk at the event, signing his goods and ultimately choosing the winning ticket in the Mini giveaway. Drat I didn't win! The consensus on our turbo is that it is one of three things but not a new turbo, so a bit of work for Mrs Peanut to do in the engine bay department! Anyway it was a good day, the weather stayed fair and we were sheltered anyway in the two big halls. It was as always a great chance to catch up with old friends in the MINI scene and make one or two new ones, and yes there were plenty of original GPs there to torment me as they always do at these events! As always click the photos to see a slideshow of photos from the day! 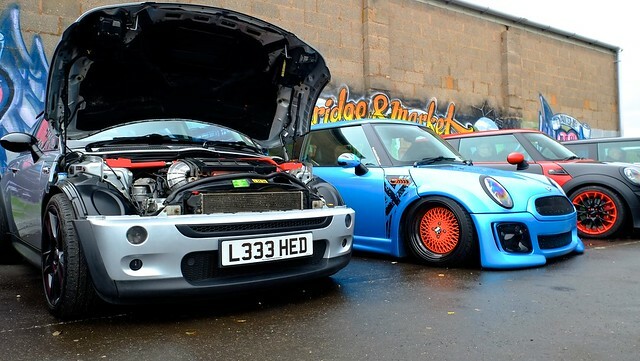 The Big MINI Show is a new MINI show on the scene specifically for BMW MINIs and held this year at Penkridge Market in Staffordshire. 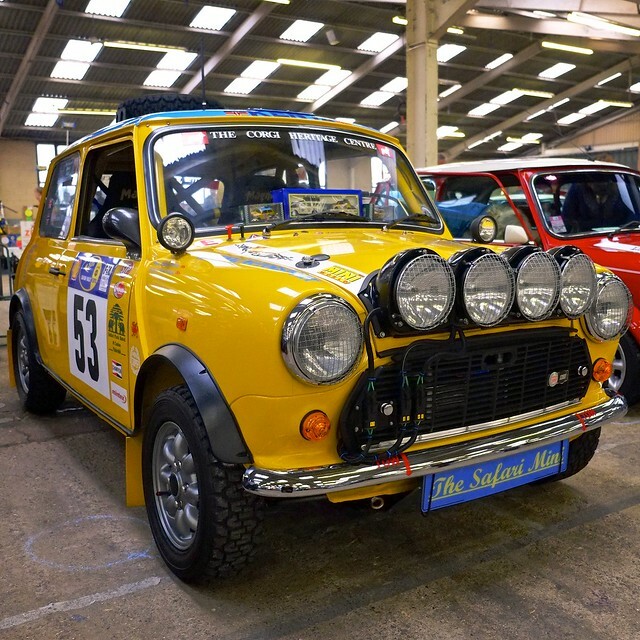 We were at the show with Surrey New MINI Club but we drove there from my Mum's in Chester and got there just before 9 in the morning. When we hit the M6 we slowed down hoping to see more MINIs heading for the show and very quickly got tangled up with a large gaggle of MINIs from The Mersey MINI Club who were going to the show. It was great fun joining their convoy and the trip down went very quickly. We were the first to arrive on the Surrey New MINI stand and were directed to the end of the car park along a wall. Before we had finished parking an old pal Emu_P turned up in his R56 and parked next to us. We spent the next half hour with Emu sheltering from the rain under a large market shed and catching up. Finally the rain eased so we set off for our first tour of the event. On the plus side, there were a good number of traders there catering for new MINIs and there were plenty of bits and pieces to look at on the stalls. Again on the plus side we bumped into a lot of familiar faces and old friends. Brettles and Czar from the Clubman Register, The Gidfather from yam MINI, Mad Pig from Surrey New MINI, Chris was there on the MINI stand and he was later joined by his wife Christine and her sister Caroline. It was good chatting to all these old pals and it certainly made the day fly by. The food stand was slow and the queue long but the food was well priced and tea at 70p was very fair. This was in sharp contrast to Himley Hall earlier in the year where we had to pay £2 for a tea! So, a good turn out from the clubs and traders, and well priced food available really helped the day. On the downside though, it is not a pretty place to be, as it was in truth an unglorified car park and when this was coupled with the poor weather the photos from the day were never going to be brilliant! I think I am spoiled having the beautiful Three Counties Showground on my doorstep, as Penkridge market is just never going to compete with that for providing a lovely backdrop for the MINIs. On balance then a fantastic first attempt at putting on a new MINI event. These things are not easy and if this had been held in a field then it would have been a disaster with the weather we had, so on balance we have to forgive Penkridge its less than beautiful setting. Anyway click our pictures to see a few photos from the day! Another early morning start for us and another day out with cars - we love it. 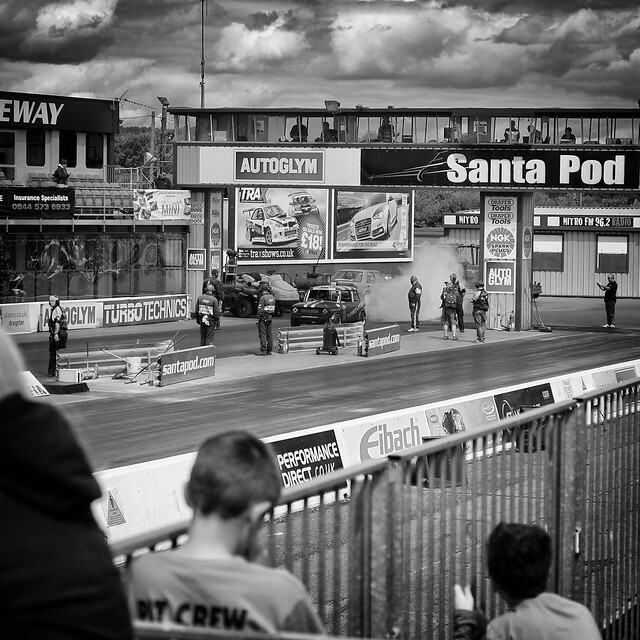 This time we travelled to Santa Pod in Northamptonshirefor the annual Mini in the Park show which gives us a chance to meet up with old friends that we don't see so much now that there are fewer runs and outings than there used to be. With a few miles to go we caught up with three Gen 1 GPs and again thought how much we would like one, that itch never goes away for us and then we travelled into the show with them. 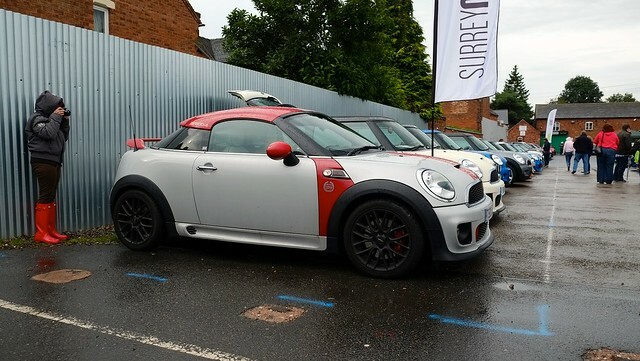 We took the Clubman this time as he hasn't had many outings lately because of the new boy - SilverBeast our JCW MINI Coupé - and we didn't want him to feel left out. We arrived just after 9 and the Clubman Register stand was already set up and everyone had left for their breakfasts. We had a slow mooch through the stands and stalls, were tempted by a few items but returned empty handed to the Clubman stand where we began to make our bacon baps, tea and coffee. Then we heard a rumour that there were MINI bags of cleaning products for sale at one of the stands for £5, not sure how we missed them, but Beastie dashed off to pick one up while I battled with two nearly empty gas canisters before finally finding a decent one, and at last the kettle boiled. We had a long brunch chatting and catching up with old friends. 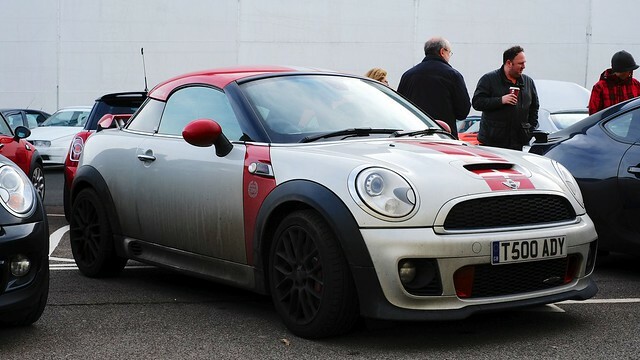 Brettles was there with his son Branston who had also brought his own MINI a very tast pedal powered red JCW! Czar too was there in a brand new Generation 2 MINI GP, which was a lovely car, but being on a Clubman stand it was alas naturally outshone by the infinitely more handsome Clubmans on show! We spent some time putting the world to rights with Czar and then made another tour of the site stopping briefly to watch the rocket powered car go down the drag strip. We had bumped into our old pal Elliott and chatted with him, while we watched the rocket powered Mini do its stuff. He was on fine form as always and had us in stitches as he outlined the alternative options he had for his Sunday before electing to come along to Santa Pod. After a while we realised that rocket power was not for us though and after a few pictures we left to explore some more. We bumped into an old pal from The NewMINIseverns days Emu_P with his girlfriend Helen on the New MINI Surrey stand and admired his Cooper SD before heading back to the Clubman gazebo and more tea! The weather had slowly improved through the day and as the sun was shining we treated ourselves to an ice cream and pondered upon how much we like this life in the fast lane. hey don't mock, if you are slow with tose ice creams they can melt real quick! Click on The GP for a wall of Photos from the day and on any of the other images for a slideshow from the day! We needed an early start to get to Wilton House for this event and we were still a little late as it is always further than we think. 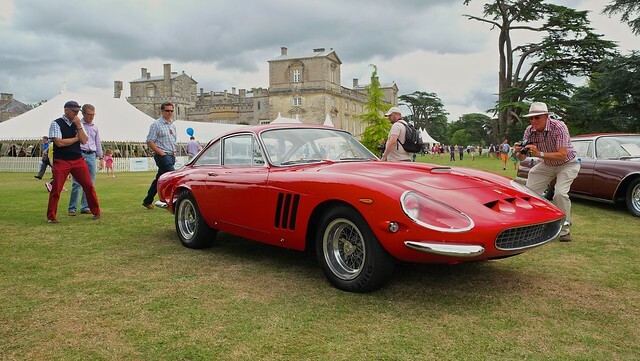 As we had signed up with Pistonheads we had a space on their reserved parking area which overlooks both the show and the house. The parking area is set up on a bank making it a very pleasant place to park and to enjoy your picnic later and being full of Pistonheads too, there is an abundance of nice cars to see in the field. 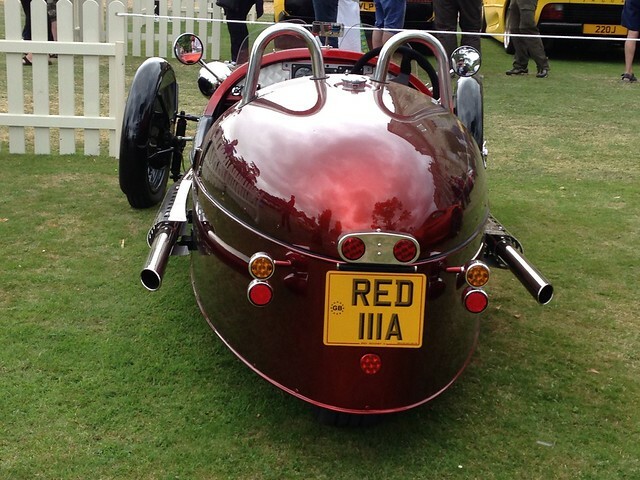 Driving into the show is always fun as there are many interesting cars to spot on the way in. We took the Opel GT as it still turns head and has a proper place at a car event being a rare creature itself. We met up with Dealmaker and Star Girl when we got there and Fandango and The Elf shortly after and spent a while looking at and in, the many new cars on show on the Dealer stands, Then we browsed the old and the rare before finally heading off to watch the parade of supercars at 12 noon. Soon it was time for lunch so we headed back to our car and set up our stove for bacon baps, tea and coffee. From our position we had an amazing view of the stunt bike display and got a real sense of just how far and high they flew. God that was seriously impressive. After lunch we went to explore the Supercar display now that they were all parked up and watched the helicopter display as we walked. 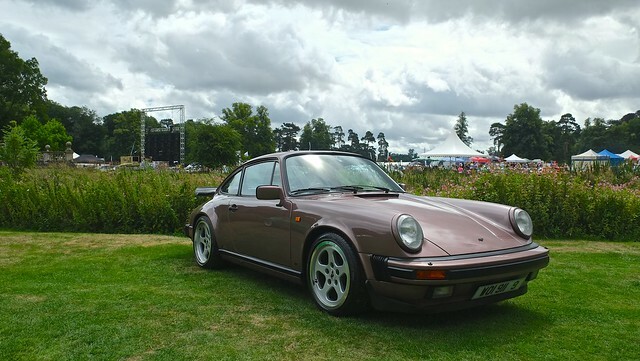 We are definitely in a Porsche mood at the moment and it was the classic 911s that persistently caught our eye. You might get a sens of this when you browse our photos from the day by clicking on the photos. Late afternoon it started to rain a little so it seemed a good time to head home, tired but full of dreams. It was as always a lovely show in a beautiful setting, good value for money and a very good day out all round, with great company to top it all. Click the photos to see a slideshow of pictures from the day. Click on this photo to see our iPhone snaps from the day. 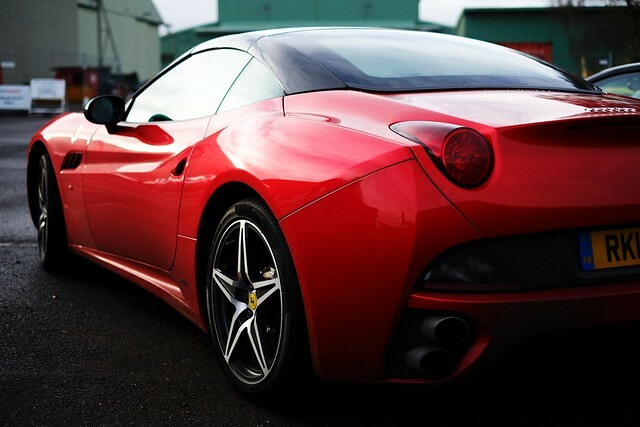 Our recent Italian Road Trip saw us visit the Ferrari Museum. If Ferrari is your thing then this and a factory visit would be the focus of your planned pilgrimage, for us though, while it was a great afternoon out, it did have a feel of being in a car showroom. I sound a bit negative, I'm not but I do find spotting a ferrari in the wild more exciting than overdosing on red Ferrari's here. Top photo for a slideshow and bottom image for a wall of Ferraris!